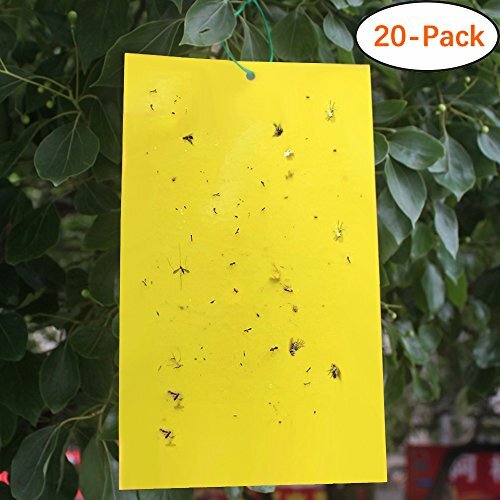 Most of the pests have phototaxis, and yellow is the favorite color of common pests like aphids, leaf miner, fungus gnats, thrips, white flies, midges and so on, with this Trapro yellow sticky trap, pests just can not control themselves and keep flying towards it. 100% made from non-toxic material, high and low temperature resistant and waterproof, controlling pests in a more Eco friendly and economical way, ideal for garden, farm, houseplant and greenhouse use. For small plants: Place the yellow sticky board tightly on a stick (not included), and insert it into the underground. For best performance, we recommend an using denisty of 1pcs/200 square feet or 200pcs/1 acre. If touch the adhesive accidentally, just wash your hands with some vegetable oil or waterless hand cleaner. Specially designed for flying plant pests that like yellow color and easily trap them. Made of Non-toxic material, controlling pests in a more ECO friendly and economical way. Great for capturing aphids, leaf miners, fungus gnats, thrips, white flies, midges. Dimension: 6*8 inches; Pack of 20 pcs; Wire ties included. KINDLY NOTE - This product is for trapping flying plant insect only, good for outdoor plant or houseplant, but not applicable for other home pest in house / kitchen / garage like fruit flies, mosquitos and bugs. If you have any questions about this product by Trapro, contact us by completing and submitting the form below. If you are looking for a specif part number, please include it with your message.